Water with minerals is better than just tap water. The Prestige Water cooler is a combination of a water filter and purifier with a cooling and heating element. 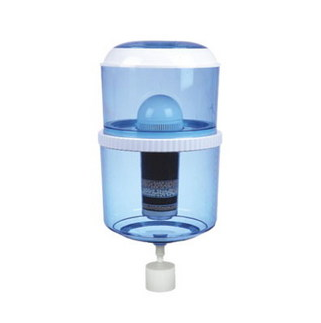 With our 7-stage filter system, you convert tap water into great tasting drinking water. During this process, the pH value of the water increases into basic or alkaline water. Further the mineral stones will increases the oxygen level and many different minerals and trace elements are added to the water. The water cooler is equipped with a cooling and heating tap. This will chilled water to approx. 10 degrees C and heat water up to 97 degrees C. Mineral water, as we know it, is made by rainwater and seeps slowly through various soil layers. As a result it is filtered and important minerals and trace elements are taken on and also the water comes in contact with the eart's magnetic field. Our filter system follows this process exactly. Water is a good thirst quencher, but it will also be used in major ingredients in coffee, tea, soup and other foods. Healthy water is pure and the purity improves the taste. Actually I should drink more water - Useful tips. Water is life. There can be no life without water. We have to keep drinking constantly to hydrate our body sufficiently. Our body consists of about 70 - 75% water. This percentage must be maintained for good health. After oxygen, water is the most important element we feed our bodies with. Dehydration, dehydration, can occur in any season. It is therefore necessary to drink sufficient water even in the cold months. It is almost impossible for the body to extract water from, for example, fruit and vegetables. That is why it is essential to drink extra water.Coffee, alcohol and soft drinks remove water from the body and also prevent good digestion due to the large amounts of sugar that are present in it. Water plays an essential role in almost every body function. Our blood consists of 90% water and the brain even contains 96% water. It should therefore be clear that water of good quality is essential for good health. Water is essential for proper digestion, the absorption of nutrients and chemical reactions in the body. Water is essential for good circulation and determines the health of every cell. Water is essential for the removal of waste products mainly from the digestive system. A low PH value is the biggest enemy of our body. Drinking 'deacidified', alkaline water (Ph> 8) can give health a huge boost. Water is essential in regulating our body temperature. For optimal regulation of the body temperature we must get at least 2 liters of water. If we constantly fail to drink enough water, this can result in chronic cellular dehydration. Characteristic of Chronic Cellular Dehydration are nutritional deficiencies, frequent colds and flu and reduced recovery capacity of training. Water with, preferably, a PH value of> 7.5 lowers the acidity of our body. The body becomes more basic. Digestion, training and stress are some of the causes that can make our bodies acidic. Diseases thrive in an acid environment and it is therefore important to ensure this acid-base balance. The minimum amount of water that a healthy adult of about 80 kg. should drink for maintaining good health is about 2.5 liters. For every additional 10 kg. would be about 250 ml. need to be drunk extra. A fanatic athlete or athlete is recommended to drink 3.5 liters of water. Tips for summer. How many drinks does a child need. Divide the amount of water to drink over the entire day, instead of drinking the entire amount in a short period of time. Many people are afraid that due to the increased amount of water they have to drink, they have to go to the toilet a lot. However, the bladder will become accustomed to this increased amount within a few days. Do not wait until you are thirsty until you are thirsty because the thirst signal only comes in if you are already showing symptoms of dehydration. Water is also the cheapest and most effective 'supplement' when we talk about an increase in strength and endurance. Most people, including top athletes, drink too little water. This means that they are constantly dehydrated. If we hydrate the body sufficiently, that is, if we restore the moisture balance by drinking enough water, the strength will increase by 10 - 15% and the endurance by as much as 20 - 30%. Water is, as you can see, perhaps the most important food that we need.